This cast metal plant stake is manufactured by pouring liquid metal into a mould (or cast) which has been especially made to suit your wording. Finished with a Black Powder Coating, it will be supplied with a metal stake. It will last for years outdoors and will require little maintenance. The plaque is made to order and we estimate that despatch will be made in approximately 3-4 weeks from the receipt of your order instructions and payment. The font style used is Times New Roman. When adding your text instructions to your order please use CAPITALS and Lower Case lettering as you would like it on the plaque. We arrange for all text to be centered on labels. If you would like your text to be aligned differently, please specify in the order notes section during checkout. 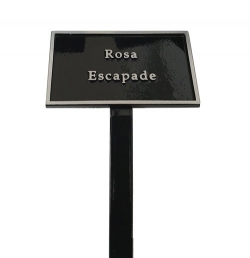 Once we have received your order, we will send you an email with your plaque artwork attached. Please note we do not offer a spell or grammar checking service. So, please ensure that the information you send us is correct. Once artwork has been submitted we will allow a maximum of one revision to be made. Further revisions to artwork will incur a charge of £5 + VAT. 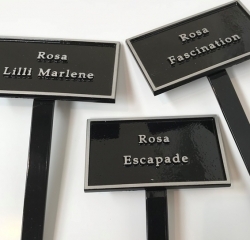 Only once you confirm your acceptance of the artwork, will we produce your plaque. Once your order has been received. 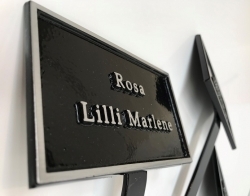 We will send you an email showing how we propose to layout the text on your plaque. 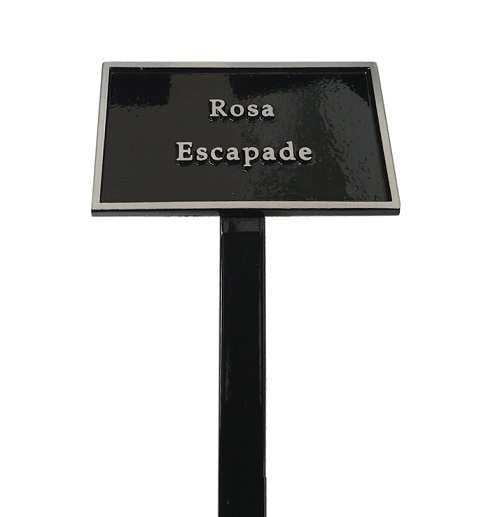 Should any amendments be required they can be done at this point BEFORE the plaque is made for you. 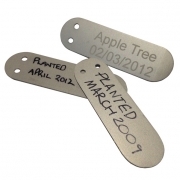 Silver Anodised Aluminium plant tags, supplied in packs of 10. 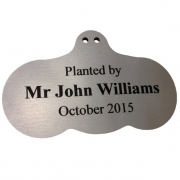 Engraved Aluminium Tree Tags, shaped decoratively to offer a different option for your garden. Thank you for sending the aluminium labels which I received this week. They are just right.